“It’s just a dog…it’s not like it’s your kid”. “You don’t have to touch every dog you walk by, you know”. 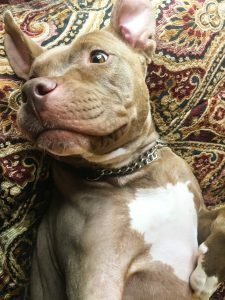 …The type of (ridiculous) questions you are used to being asked when you’re head over paws in love with your wagging, slobbering, adorable fur child. Like me. My answer to them all: A prompt and sassy eye-roll. When I relocated from Maryland to Charlotte, I was pleasantly surprised by how drastic the difference was between the North-east’s and the South’s definition of “dog friendly”. Yes, I love my hometown of Frederick and how great it was to be able to walk my dog downtown and in the park freely with minimal issues. However, in living in both Mooresville (Lake Norman) and Charlotte since I’ve relocated, I’ve noticed the difference in the level of acceptance of dogs into local restaurants, shops, activity centers and entertainment facilities. 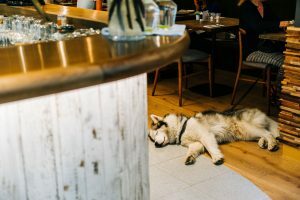 There are even entire bars specifically designed to allow dogs and keep them, as well as you, entertained and happy (we’re talking more than just 2 or 3…they’re everywhere!). Personally, I’ve had wonderful experiences with Lucky Dog Bark & Brew (multiple locations) for both day care and boarding services, as well as their bar scene. Their outdoor patio is great for the dog days of Summer when you want to grab a few drinks with friends but don’t want to leave the pup out of the fun. Although the patio is Kai and I’s favorite chill spot, they also have an indoor bar where dogs are obviously welcome as well. Another great spot for dogs and drinks is The Dog Bar in the North Davidson district of Charlotte. Live music, drink specials, and an indoor/outdoor off-leash play area for the doggies is what makes this place awesome. A few other mention-worthy restaurant and bar hang outs for humans and dogs alike are The Canine Cafe which offers a pet spa and human AND dog food menus, Seoul Food Meat Co., VBGB Beer Hall and Garden/Restaurant, Thomas Street Tavern, and most breweries that have outdoor patios including The Olde Mecklenburg Brewery and NoDa Brewing Co. 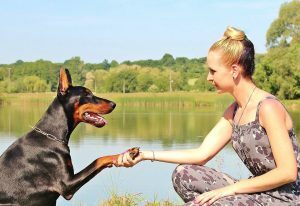 There are SO many more dog-friendly bars and restaurants in the Charlotte/Lake Norman area…these are just a few of my personal favorites and recommendations from others. Not only can you bring your pup along with you for a day/night out in the city…you can also bring them with you to the lake! Most boat clubs in Lake Norman allow you to bring them with you on the boat, and even have cute little doggie life jackets you can purchase! How adorable would your pup look in one of those things? Just think of the family photos… Freedom Boat Club of Lake Norman is an amazing team to work with, and they encourage you to bring your pets with you on your day on the lake. Other boat clubs on Lake Norman that allow dogs include Carefree Boat Club and Aquaventure Boat Club.